If you are a Twitter buff, you’ve likely seen the new profile design that Twitter announced a month ago, which includes a header image and a centered avatar (profile picture). Many social media enthusiasts and designers are criticizing the new design for its awkward layout, and undeniable similarity to Facebook’s cover photo which rolled out with the launch of Timeline. So, why update your header image? 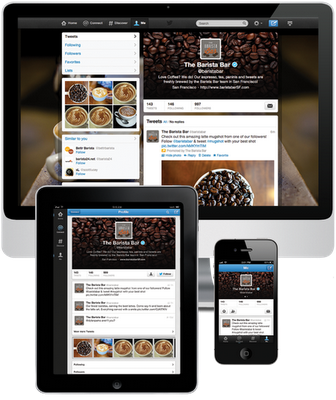 As of June, 2012, 60% of Twitter’s 140-million-person active user base accesses the service via mobile devices (up from 55% of 100-million in September, 2011). On mobile (and tablet) devices, the Twitter background imagery is not displayed, however the header image and avatar are prominent. According to Twitter, eventually, all profiles will be updated to the new design automatically but Twitter will notify all users before making this change. What do you think of Twitter’s new profile design? Have you uploaded your header image? Comment with your Twitter handle and your thoughts below!